I am SO close to being done with the first corner! I'll be working on it today, and I'm sure I'll finish it. To me, that's great progress. As you can see, I've already started the second corner too, so maybe I'll be able to do more on it also. I really like all the blues in these corners. They're going to pop out of the piece, especially with beads on. I am so pleased with the amount of progress on part three I'm making. 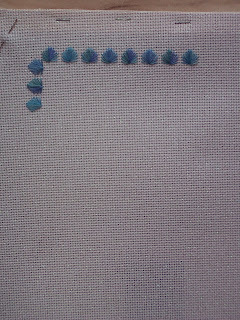 I've got most of the cross stitches and half stitches done on the first arch already. I'll definitely not be spending ten months on this part, thankfully! I've been getting a lot of the folds of this particular part of the skirt done. I'll probably start adding some of the flag soon. It's coming along fairly quickly for me, and I'm pleased with my progress. I started and am almost done with the band I started this week. All I have to do is add three eyelet stitches. I'll be doing that today and then starting the next band. I've got maybe two or three bands to go and then add the beads before making it up into the huswif. It'll get there. This is probably the next non-round robin piece I'll get done. I need to remind myself to count twice, stitch once. I think I pulled out the stitches on this band at least thrice to get them to line up right. In the end, it looks really good. My husband, of course, says it reminds him of string art. 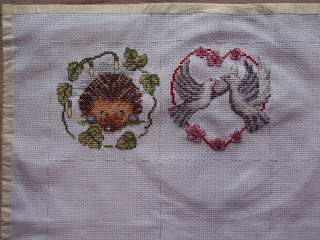 I'll work the border down a bit more before starting the second row. Definitely will be getting to it again this week, and hopefully I'll remember to take my own advice! This week I did a lot of outlining with Bleu Sage floss. It made it look like a lot of progress. I'm still getting there on this. It's beginning to feel like part two of my Midi Mystery, which just went on and on and on, but turned out fabulous in the end when it was done. I just hope it doesn't take the ten months or so that part took with the midi. I added the first of the metallics on Tuscany this week. It is a multicolored one, with bits of red and green in it and brings out the red of the columns well. I managed to do more since this picture, in fact I think I've stitched on everything this week (something I haven't done since going to France) and feel a sense of accomplishment about it! I'll be behind on this, though, after Wednesday. On the other hand, I won't be far behind. I haven't had much time for the poor little seahorse since I got back, but he has had some work done for him. The kelp strands are longer now and there's more background done. Perhaps soon I'll even get to working on the seahorse itself. As you can see, I finished band three this week and started on band four. Band four's huge, and I haven't quite decided on what threads to use where, but I'll get there. Since taking this picture, I finished the upper border of band four, which you'll see in its next picture. 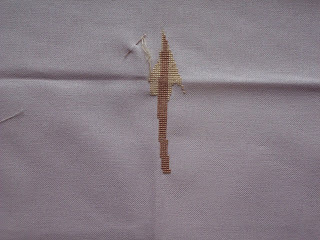 Since getting back, I've really increased the pace of my stitching. Now to see if I can keep it up! This is an open aida round robin (I didn't know it was aida until I had already signed up.) that is international. I didn't get to start this until I got home from France because it was sent to the States instead. What I have to do is the area from what is already done to the upper blue line. Since this picture was taken, I've made quite a bit of progress and expect to be done by the end of the week. I then send it on to India, where I sent my planet piece, which is part of this round robin. I got another band done on this this week. And ... my husband brought me home the last installment of the mystery, how to make the huswif. 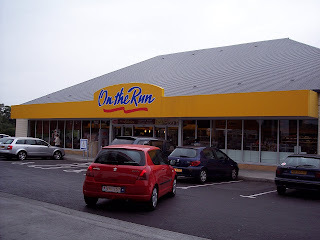 Of course, it went to France AFTER I left. It was mailed after I left. Luckily he was still there and got it for me. I'm very disappointed with the customer service of Carol Tinson and will not order anything from Heirloom Embroideries again. She really needs to treat her business as a business instead of something to be pushed off until she feels like it. This is almost done and then I will not bother with her again! I started on the first row of Cobblefield Road this week. It went pretty quickly, but it takes up a LOT of thread. That's why I stopped - I'd gone through more lengths of thread than usual for a rotation. I'll be back to this this week, I hope. It's coming along and I like the colors, though I think I wouldn't have used wool for the top diagonal on the squares. Well, it still doesn't look like a lady, even if it's part of her skirt, but at least the progress is visible. The kit I'm working this from had very very long cuts of floss, so I just fold them in half and do a whole length at a time. This means I'm actually doing more stitches per length on this than I am on my other projects, which leads to more progress. It's been pretty easy to do so far, at least. Maybe when I get to the flag it'll be harder. I've gotten a bit more done on this since the picture was taken. The silver is added, and I did quite a bit of bleu sage on the right side swirl. Still making progress, though it seems slooow. I think that's because parts two and three are just plain a lot of stitching. The rest don't seem to be too much until you get to the houses. I'll have time to do more stitching now, though. One great thing about finishing stuff is you can start something else! 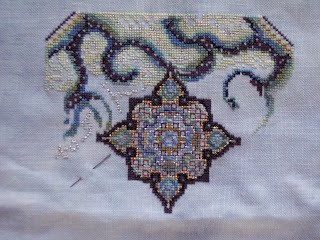 This is my latest start - Tuscany Town Mandala from Chatelaine. I'm using Picture This Plus's Carnival linen as the fabric and all silks, to the point I ordered Vikki Clayton silks to substitute for the DMC colors. It's going to a very good friend of mine - he bought the pattern - and I'll be trying to get it done in a reasonable time frame. So far, I really like the color on the fabric. 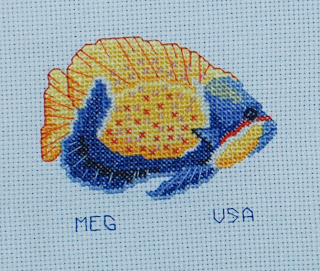 I finished my fish for Sue's round robin piece on Saturday and mailed it out yesterday. The pattern is from a French magazine I picked up at the grocery store when I was there. The initials were me playing around with font styles. 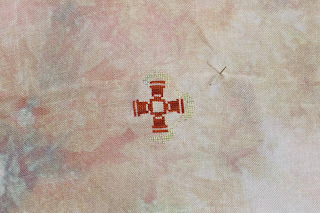 It came out all right, but there were a LOT of quarter crosses on this and that's the absolute worst to do on Aida... but it's done now. I hope she likes it. I'm feeling really good about the possibility of finishing this whole quarter this month. I can really see how close it is to completion and I like it. Now to get some time to stitch! Actually, I probably will be getting a lot of time to stitch starting on Saturday when everyone is where they're supposed to be and I've got things caught up. I'm back in the USA now - got back on Wednesday. 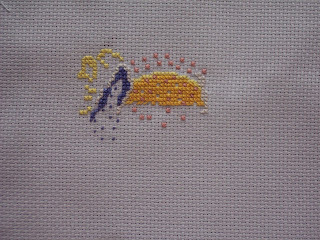 Was home less than a day before leaving again and still am jet lagged, so I'm not really doing a lot of stitching yet. Anyway, here's the progress on the Victorian Garden mystery. It's slow going, but I love looking at all the colors. This one I'll keep for me when it's done. Thank you all for your encouragement and comments on the pictures from France. I'll be using them soon to design some needlework, I believe. I'll be going back to Europe next year and will try to do the same thing! It doesn't look much like a fish in this picture, but it IS becoming one. I'm hoping to have it done by Monday so I can pop it into the mail. I think I'll be able to do it. Got more than half done after working on it this morning. 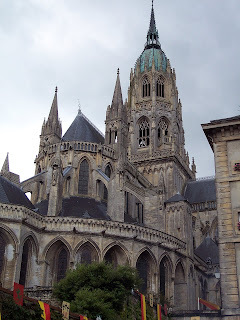 As I said in a previous post, my husband took pictures of the cathedral from several angles. Here are a few of them. Last time we were here, the cathedral had pews. I'm not sure if they're permanently removed or were just taken out for the medieval mass Sunday morning. I like the look of it better without them. I still have only two colors on this, but I can see already that I'd better really like these two colors. They're the main ones of the skirt. I probably won't get anything done this week, but at least it's started. For me, that's a good thing. 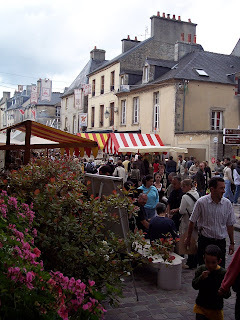 Yesterday we went to Bayeux for their annual Fete Medievales. This year was their 21st. We had no idea this was going on until Saturday, when we saw the poster for it in Creully. This thing is HUGE. 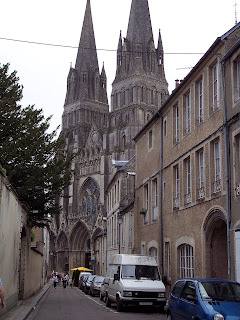 It's also in the center of Bayeux and winds through the streets. You can get lost easily and there's so much to see. Large crowd, too. Many more pictures than usual because of the size. A couple of the people in costume. 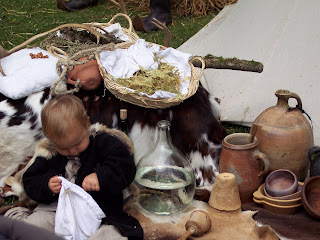 There was a good proportion of the people in costume, especially kids. The costumes were not Disneyfied, either. No Cinderellas walking around. The event was free, too, so they weren't doing it to dodge admission price. 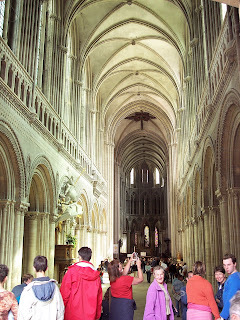 Right in front of the cathedral, this is a small span of one of the less crowded areas. It gives you an idea of the crowd. Garb for sale. Most of it is relatively well made, handcrafted, but using such things as velcro and zippers. Usually, both those things are not visible when worn. 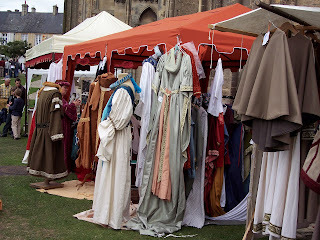 More garb for sale. 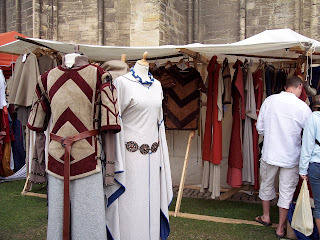 I especially liked the tabard. 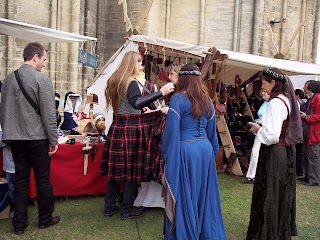 It was womanly, yet protective for archery. 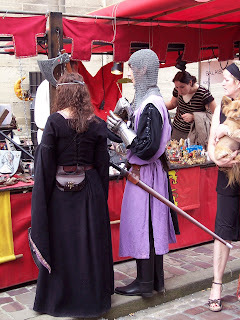 This is one thing I'm not used to seeing at Ren Faires, but there were a lot of them - senior citizens in costume. 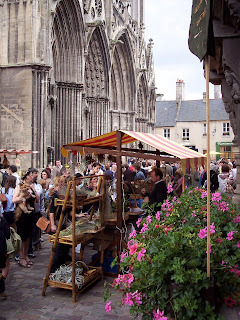 Most of them were better than this lady with the glitz, but notice what she's doing - she's making Bayeux lace. 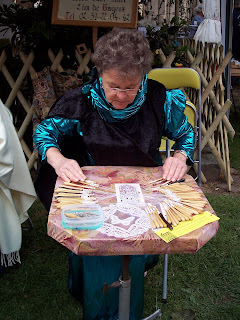 There were about twenty people making bobbin lace - no needle lace or crochet lace - throughout the fete. Many pieces were for sale. It seems there's a trend now to make bracelets and chokers using this technique. The masons in the shadow-courtyard of the cathedral. 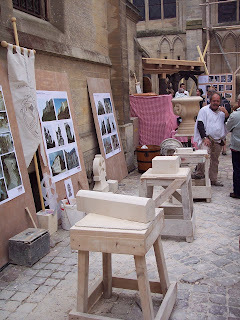 The cathedral itself is being renovated and these pieces will eventually be part of it. 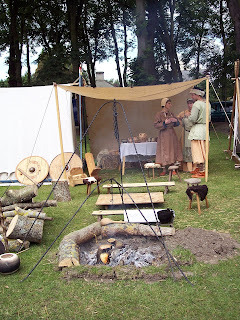 They're using, in the main, medieval techniques, especially for the details. For the big stuff, they use power tools. I just think it was the perfect place to set this up. The masons and carpenters wore white shifts and did try to dress up somewhat. Most wore jeans, too. My husband was snickering because of the fits OSHA would throw at their practices. Not even in the pictures of their workshops was there a pair of safety glasses. 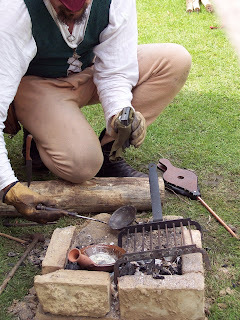 This man was making a leather sheath. 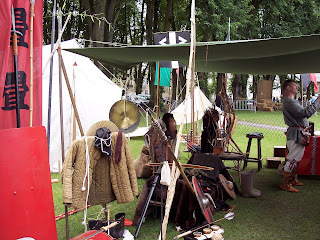 He had a lot of swords for sale and evidently, later in the afternoon, was part of an arms demonstration. A silversmith actually casting buttons. He finished them well, too. His stuff was beautiful. Even the babies get into the act. One of two gers that were set up. This one is of twill. The other was of felt and obviously custom made or brought back from Mongolia. 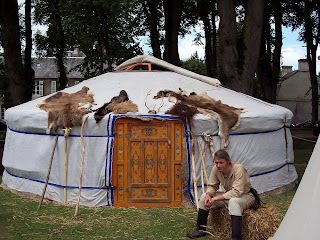 I have to say these things looked much, much more comfortable than tents! Speaking of the tents - which would you sleep in? 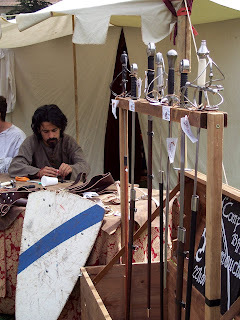 A guy demonstrating the making and parts of different weapons and armor. 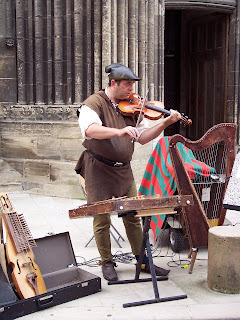 Busking in front of the cathedral entrance. 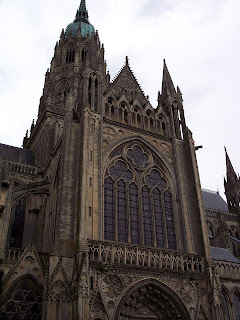 My husband took several pictures of the cathedral from different places in the festival. I'm going to put them in a separate post. 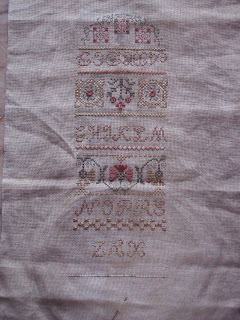 Last week, I had finished part two of this sampler. This week, I finished the first band of part three and started the very large second band. It's packed now for the trip home on Wednesday, so I won't be working on it until close to the weekend. 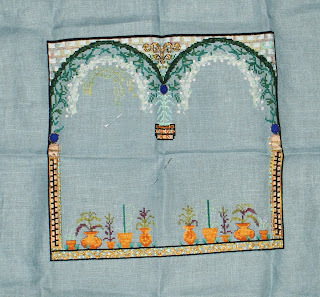 Maybe, when I get home, I'll -finally- have my last package from Heirloom Embroideries. This trip would not have been possible without my husband being sent over here to France to work for all this time. Thank you ExxonMobil for the opportunity! 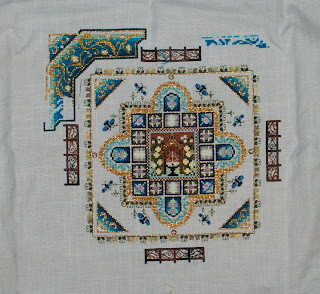 I'm taking the American Needlepoint Guild's cyberworkshop Cobblefield Road - a Jean Hilton design being taught by Ro Pace. I got my kit just a week before coming to France and I didn't want to start it until I finished another project, so I was just able to start it this week. The colors are beautiful greens and blues and purples - my kind of colors. Hopefully, with the big geometric stitches, it won't take too long to do. I decided it'd been a while since I posted about where I am living. It's the Chateau du Mont just outside of Beuzeville. 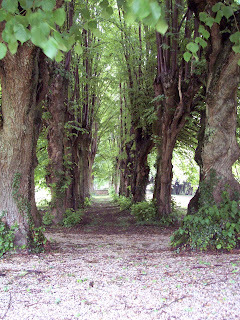 This top picture is between the lines of trees in the front garden. There used to be three lines on this side, but the caretaker took out the outside line just before we got here. This next picture is the view from the front door. 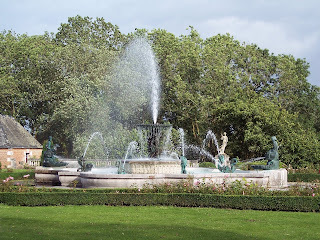 The fountain is supposed to be turned on Sundays in the summer, but it's got a leak, so it's only been turned on twice since we've been here. My husband took a lot of pictures last time it was on - on the Fourth. Yes, it's about the size of a fountain you'd find in a public plaza. 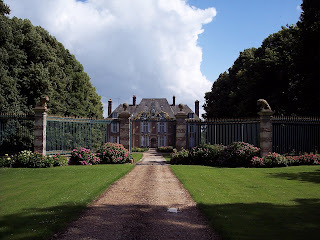 This is the view of the chateau from the first gate - yes, there are two. 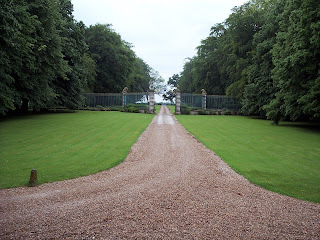 The first gate separates the property as a whole from the road. 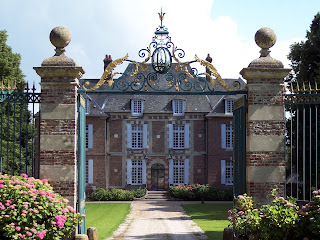 The view of the chateau from the inner gate. It's rather imposing. Driving down the driveway's fun, especially right in front of the chateau. It's covered in about six inches of pea sized gravel. I've liked living here, mostly. 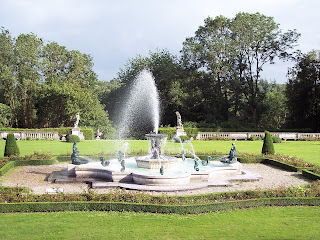 The grounds and house are beautiful, even if some rooms really need quite a bit of work. It's just hard dealing with the lack of privacy outside of your room. I like having a private dinner with my husband and son, and sometimes we get interrupted by people coming in and just talking to my husband, ignoring us eating dinner and ignoring that he's not alone. It also happens to me frequently when I'm listening to a friend and talking on the puter or listening to the news on my puter with my headphones. Someone will come in and just expect me to drop everything else I'm doing. Without those things, the place would be idyllic. I managed to finish the calendar round robin I've been working on for a few days this week. I'll be mailing it out on Monday before I leave for Paris. I've got a couple of other things to mail. This makes number two on my twenty-five project challenge. I've been -really good- this week about not buying stash. Maybe I'll get back on track. I'm not sure my suitcases can hold any more.